Engineered for maximum power and sound. 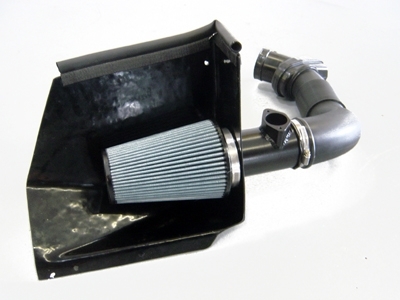 This engineered system eliminates the OEM restrictive airbox and incorporates a high flow cone air filter and sealed fresh air chamber. A cone filter has superior air flow characteristics as compared to flat panel filters. The cone filter better shapes the air as it enters through the filter for smoother straighter more formed air. Next, we have CMC machined a MAF housing to the exact tolerances of the OEM housing for precise MAF reading and NO CHECK ENGINE LIGHTS. In addition, the sealed air chamber sections off the cone air filter from the engine compartment so that it can only draw cool outside air for more power. Finally, our system is injected molded from crosslink polyethylene which has the lowest thermal conductivity rating of any single-layered moldable material available on the market today. This is key in keeping intake temperatures low and increasing power.